The eighteenth century was one of technological innovations. Popular interest in science, new inventions and technologies, had never been so strong, and saw the rising popularity of public science lectures, which often included demonstrations and live experiments. We can only imagine the wonder on people’s faces as they saw what must have seemed like magical phenomena take place in front of their very eyes. One of the most popular subjects in public demonstrations were ‘automata’. Part of the new vogue for scientific instruments, and technological advances in the manufacture of things like clockwork mechanisms, these were often machines made to resemble animals or human figures, contrived so as to appear animated and almost lifelike. Strange machines such as ‘talking’ mechanical birds and robot-like human figures weren’t uncommon. In 1775, for example, audiences in Westminster were invited to the see the ‘Incomparable Automaton Figures which represent the Grand Sultan and Sultana, which play different pieces of music in unison; and also a favourite solo’. Visitors to the New Promenade Rooms in London in 1801 could see ‘Maillardet’s Automaton’ – also known as the ‘Juvenile Artist’ that drew pictures in front of enthralled visitors’ very eyes. More than 200 years later it is still on display, now in the Franklin Institute in Philadelphia. One of the most famous automatons of the age, though, was the ‘Turk’ an automatic chess-playing machine. 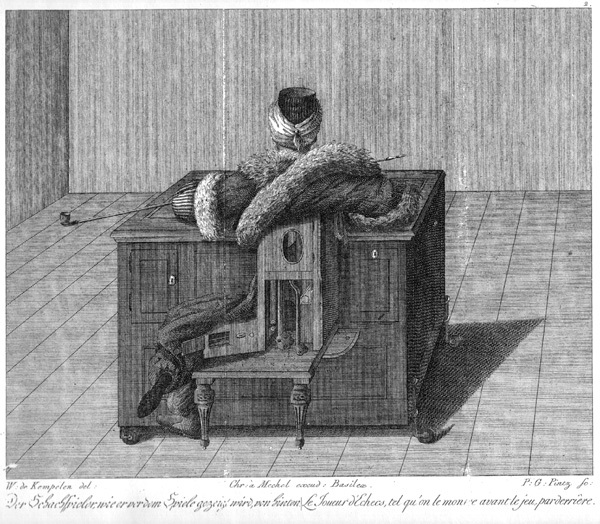 Here, a lifesized dummy of an elaborately-dressed Turkish man stood with his arm resting on a large cabinet, on which was placed the chessboard. People were invited to make a move, at which point the ‘Turk’s’ arm would magically move, accompanied by music, and sometimes changes of expression. It even said ‘check’ in French at the opportune moment. All was not what it seemed however; the ‘Turk’ was a hoax. Concealed in the large cabinet below the dummy was a human operator, who used a system of levers and pulleys, to contrive the moves, and beat the punters. Nevertheless, the deceit proved compelling, and the machine toured Europe, still being popular in the mid 19th century, before being destroyed by fire in Philadelphia in 1854. As the ‘Turk’ was consumed by fire, a witness claimed to hear a sepulchral voice repeating the fateful words… ‘echec! Echec!